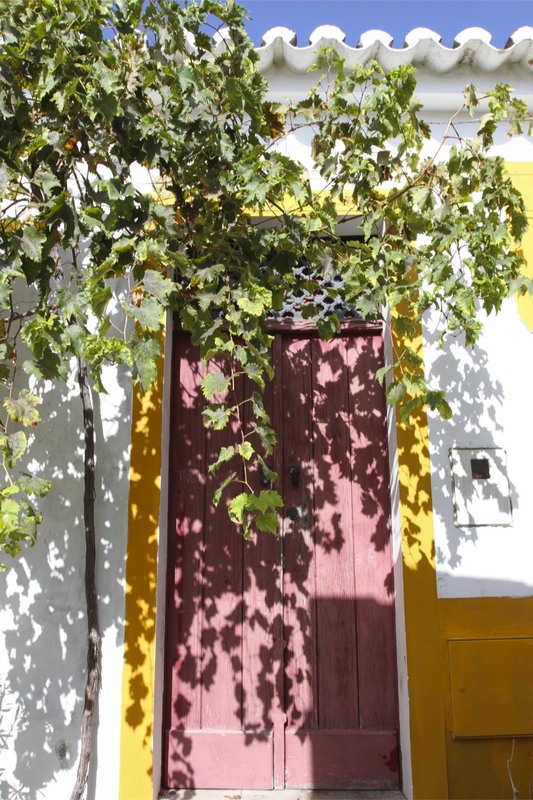 Walking around the wonderful old town of Mertola, the thing that struck me (literally) was just how hot it was, even in autumn the heat is fierce. I can’t imagine what it must be like during the summer months when temperatures are often in the mid-30s celsius or higher. 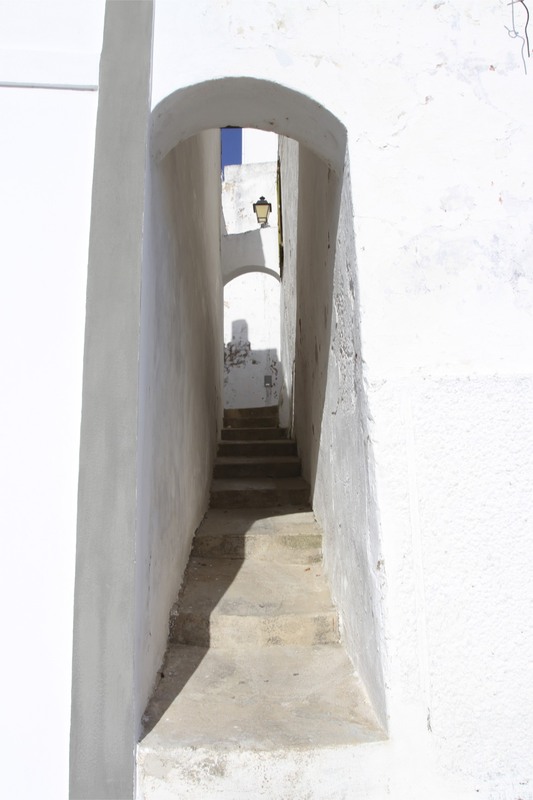 The narrow lanes don’t allow much breeze in and the constant walking up and down the steep streets soon had me fantasising about air conditioning. The heat certainly explains the generally laid back approach to life that you find in this region. 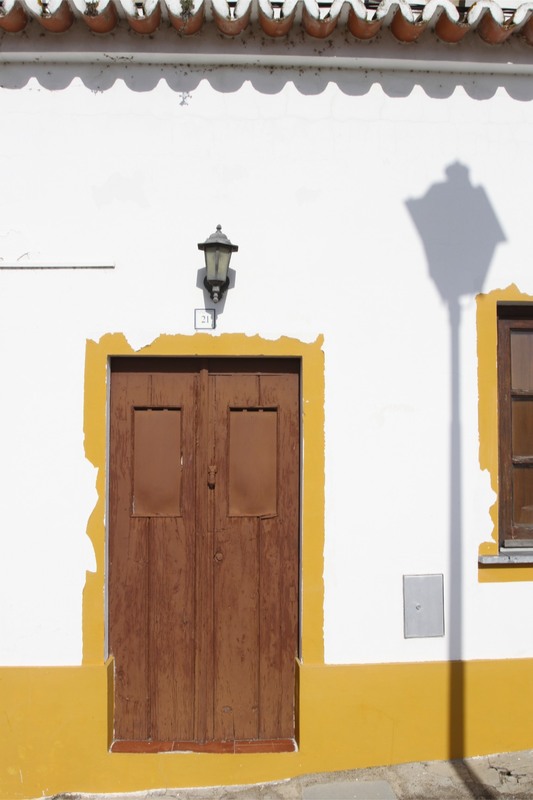 Modern Mertola is a place that belies its history. Walking the narrow cobbled streets, weaving between beautiful whitewashed houses as you pass down tiny alleys and constricted lanes, it’s hard to imagine the successive waves of history that have washed over the town: Phoenician, Roman and Moor, just some of the cultures which established themselves in Mertola. 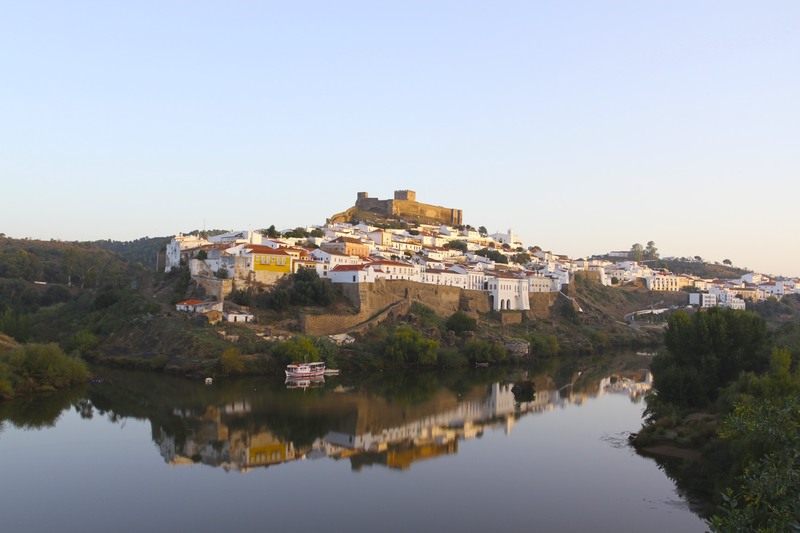 It is even harder today to imagine that the equally sleepy Rio Guadiana was a major international trade route connecting Mertola to the whole of the Mediterranean, encompassing southern Europe, North Africa and the Middle East, as well as the Atlantic coast of West Africa. 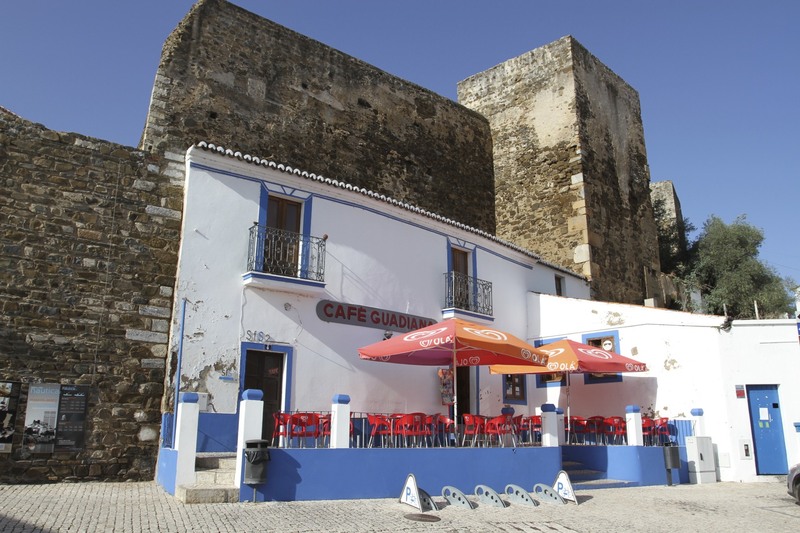 The town was well established by the period of Classical Antiquity. 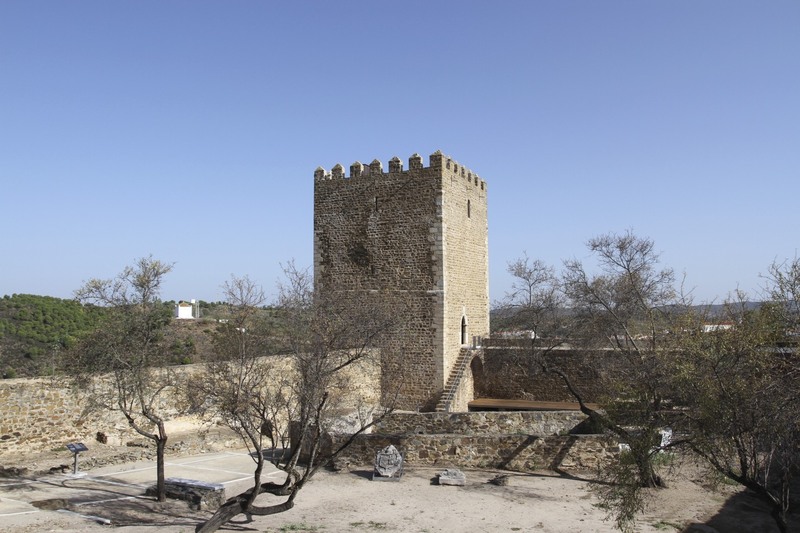 The Roman-era Torre do Rio, the fortified tower built to guard Mertola’s vital port during Roman times, is still visible on the banks of the river, the medieval walls towering overhead. 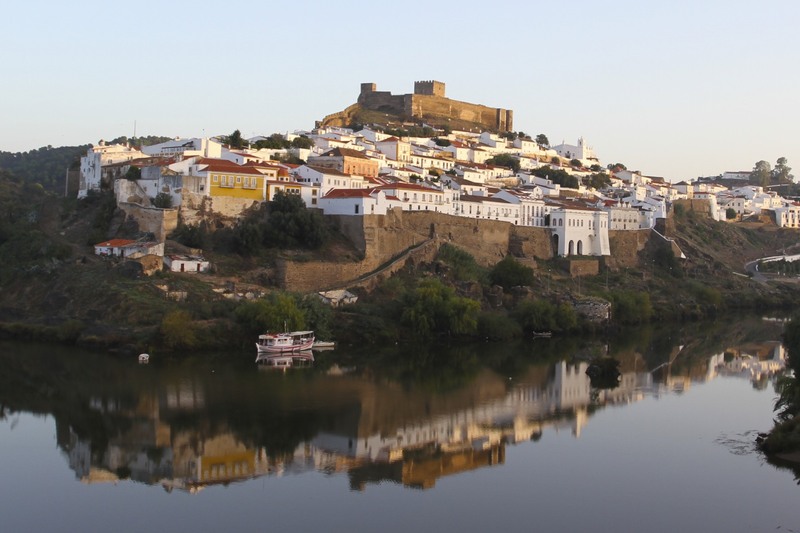 Known as the Flumen Anas to the Romans, the river’s modern name ‘Guadiana’ is derived from the Arabic ‘Wadi Ana’ dating from the 500-year period of Moorish control over this region. 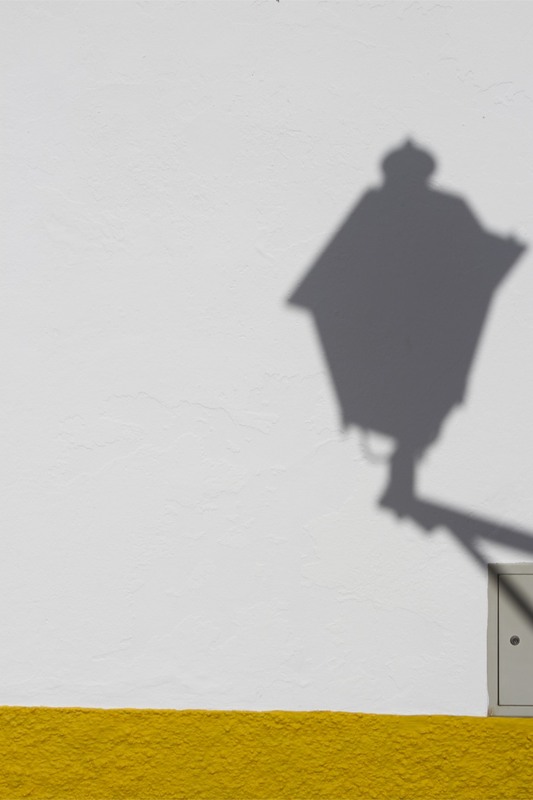 The sleepy streets and the slow pace of life lend themselves to quiet contemplation. 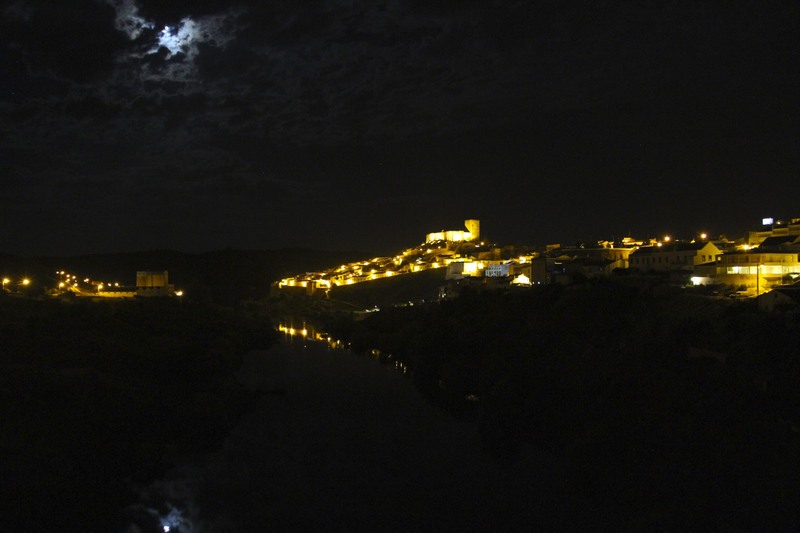 Standing on the banks of the river, day or night, Mertola’s rich history is reflected in the deep, dark waters of the river. We left the town on a circuitous route towards the coast, but not before one last look at Mertola’s watery reflection from the opposing bank of the river. 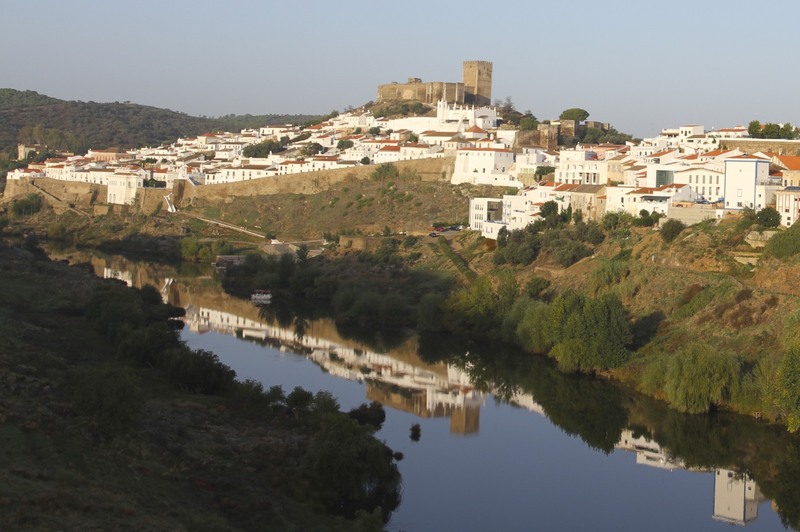 Sitting majestically on a wedge-shaped rocky hillock, its whitewashed houses and fortified walls reflected in the still waters of the Rio Guardiana, Mertola is a dramatic sight. 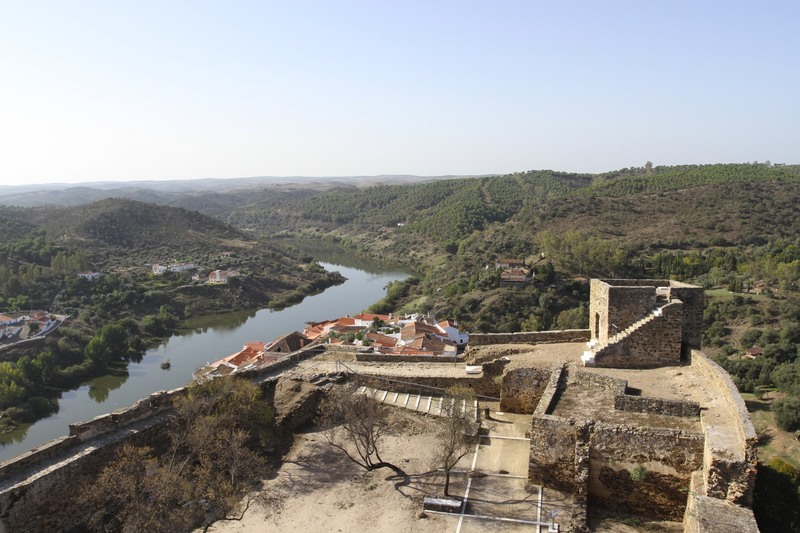 The town is squeezed into a narrow space between the jagged ravine of the Rio Oeiras on one side and the Rio Guardiana on the other; these natural defences made Mertola a near impregnable fortress and it became a wealthy trading centre. 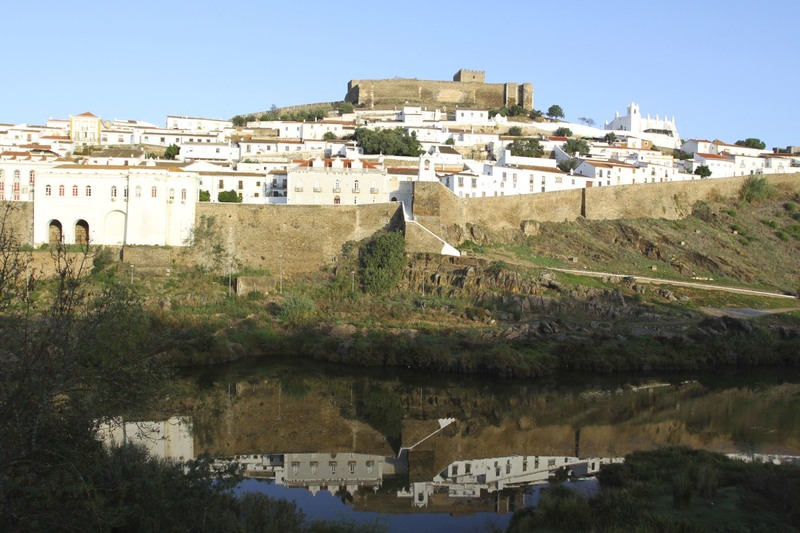 While trade and wealth grew, these physical boundaries prevented Mertola expanding in size. 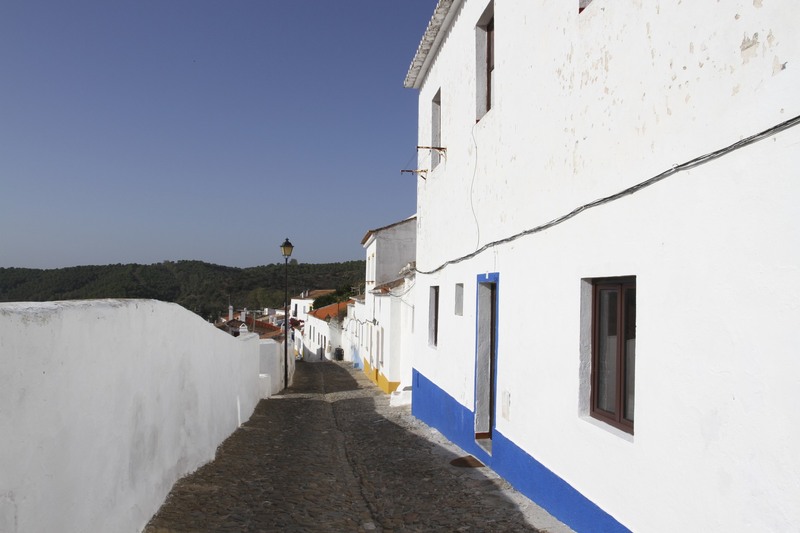 Today it has around 3000 inhabitants, the old town inside the medieval walls has far fewer. 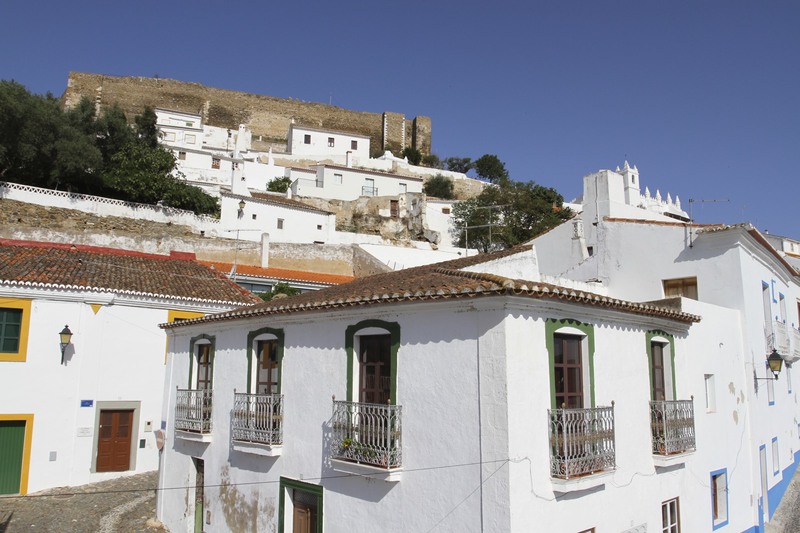 The economic and demographic decline of this region has not left Mertola untouched; despite this, the town crammed behind the walls feels more prosperous than many we’d visited, there was more life on the streets (although beware, arriving on a Monday you’ll find very little is open). Mertola’s history is similar to the rest this region: Phoenicians and Carthaginians established bases here thanks to the Rio Guardiana; the Romans followed and, with the collapse of the Roman Empire, the Visigoths. 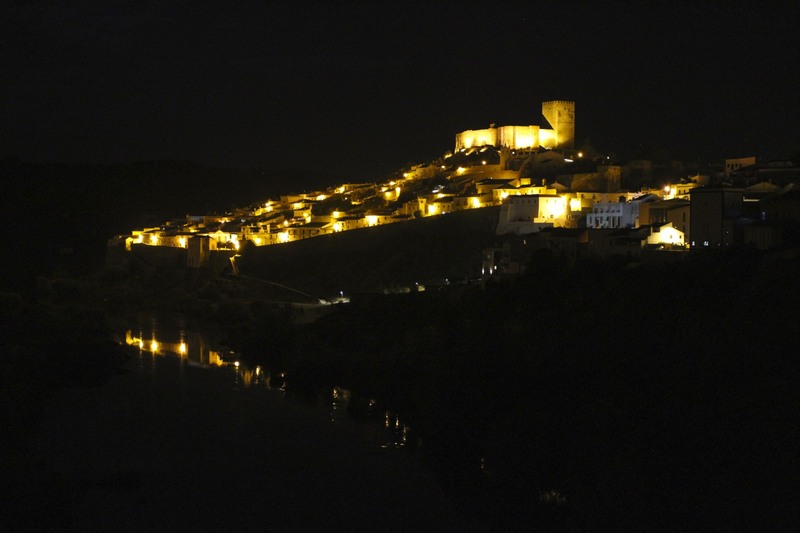 Mertola was captured by the Moors around the year 711, and remained a Moorish stronghold until the Reconquista. 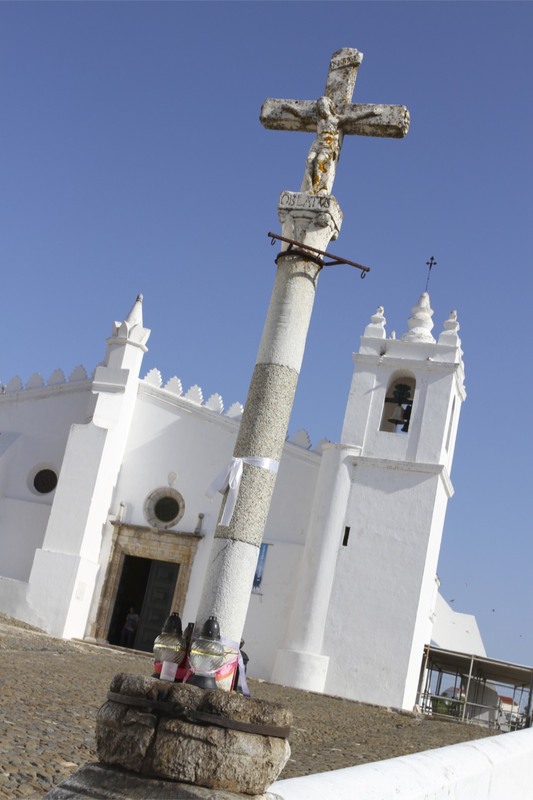 Portuguese armies reclaimed the town in 1238, after which it became a garrison for the Knights of the Order of Santiago, another medieval military-religious order. 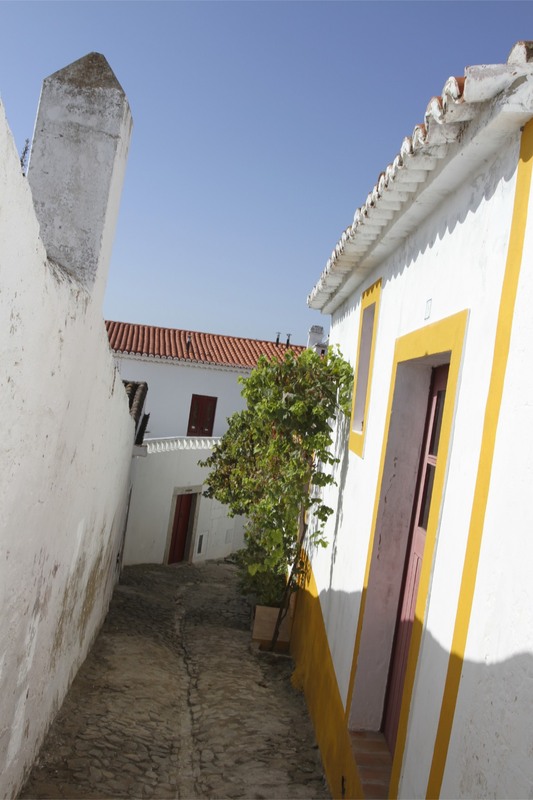 More than 500 years of Moorish rule have left an indelible mark on Mertola; the town is famed for being the ‘most Arabic’ in Portugal. To prove the point they hold an Islamic festival here every two years. 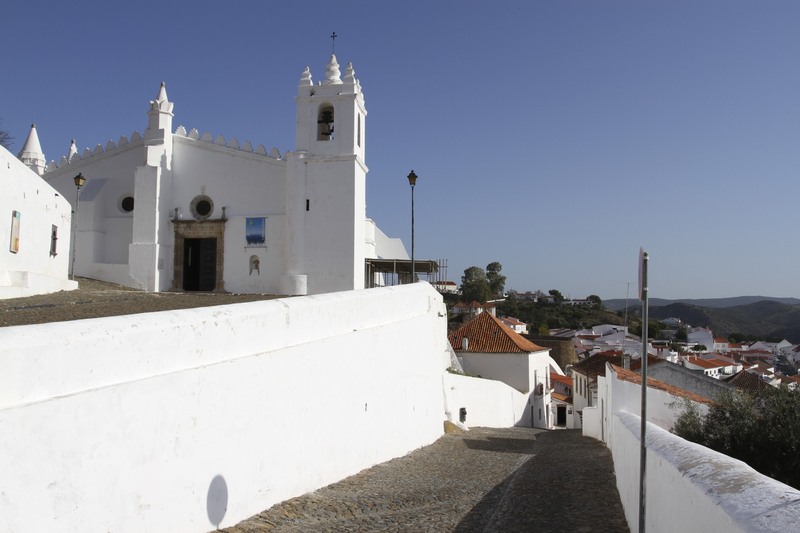 You can feel the medina-like Moorish influence walking the narrow streets, but climb up the hill towards the castle and you will arrive at the Igreja Matriz, the Church of Mary. On the outside it looks similar to any other church in this part of the world, step through the doorway though and you find yourself inside a medieval mosque. 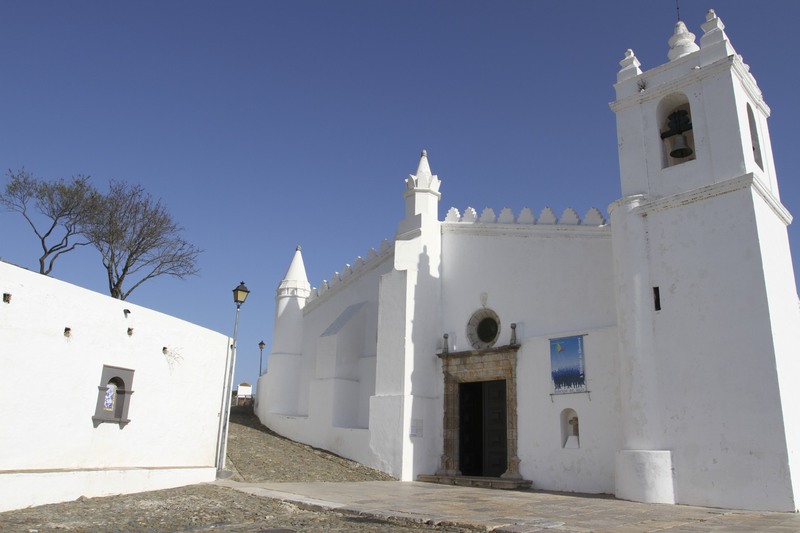 The zealotry which followed the Christian Reconquista saw most mosques destroyed, but in Mertola the mosque was reconsecrated as a church and largely preserved. 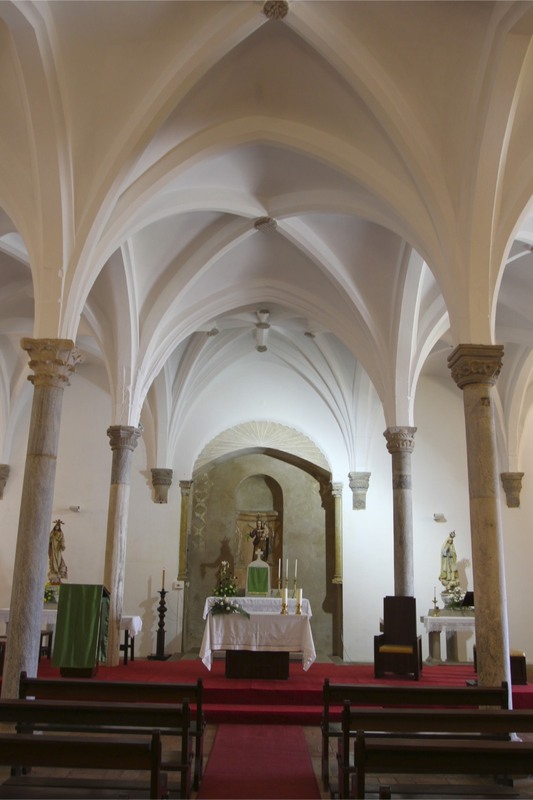 It is a small building but has beautiful vaulted ceilings. In the ferocity of the anti-Islamic fervour of the time it is remarkable, and wonderful, that the mosque survived almost intact. 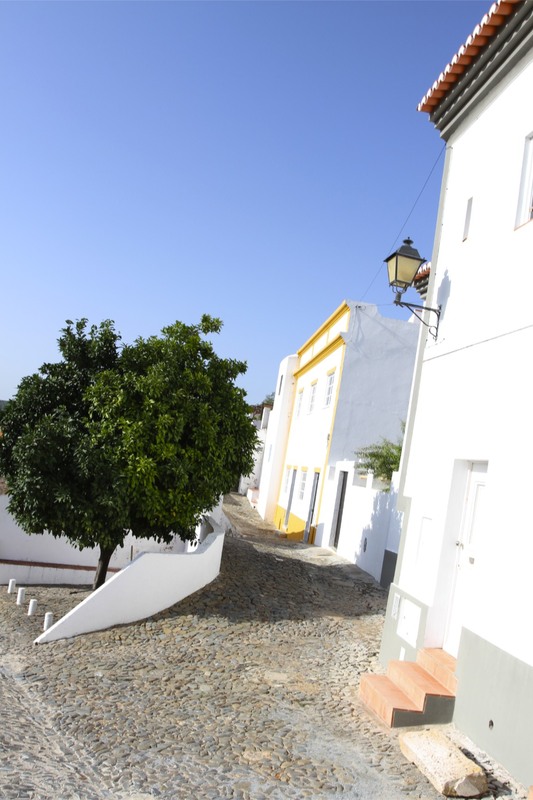 Clambering further up the hill – like every other town in the Alentejo region the streets are steep – we arrived at the imposing castle. 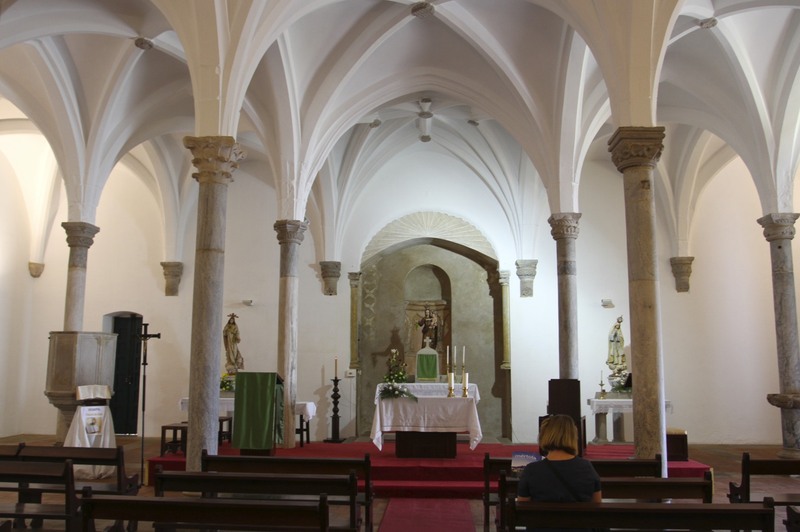 Excavations have unearthed Moorish and Roman parts to the castle, but what you see today is predominantly medieval Christian. There is an interesting historical display inside the castle’s keep, but that is overshadowed by the tremendous views. 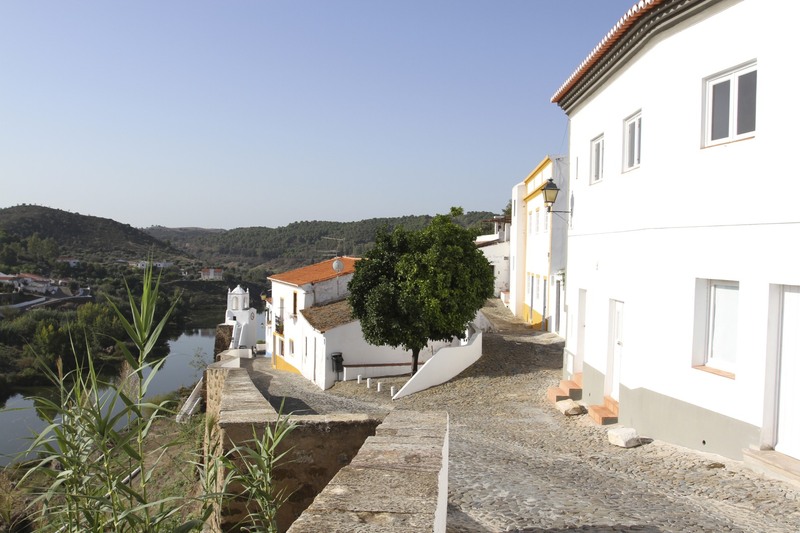 The keep offers 360º views over the surrounding countryside, over the red tiled roofs of the town and along the serene looking Rio Guardiana. It is breathtaking. From this vantage point you can see why Mertola rose to such prominence. Follow the river south and you soon find yourself at the Spanish border. For another 50km the river forms the boundary between Portugal and Spain before finally arriving in the Gulf of Cadiz – the open sea. This ocean access was the key to connecting trade routes from the interior of Portugal to the Mediterranean and North-West Africa, and made the Rio Guardiana a vital strategic route. 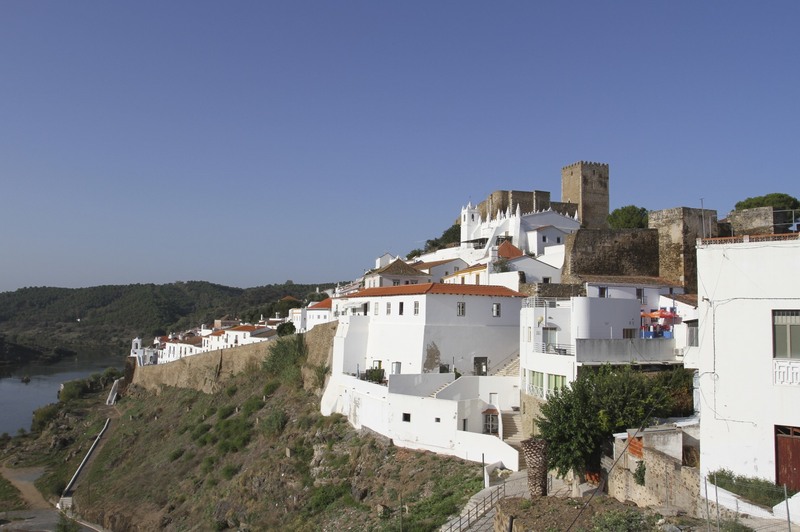 Standing on top of Mertola’s castle, you can imagine Phoenician, Roman, Moorish and Christian ships sailing into the small harbour at the base of the town. Goods from across the Mediterranean were traded for minerals and metals mined nearby, connecting this isolated region to the known world. The end of Moorish rule was a body blow to Mertola. Trade routes shifted to Lisbon and the Rio Tejo, starting a long process of decline. Once a thriving commercial centre within the Moorish empire, with Christian rule this international trade route became less-and-less important. That said, the port remained active until the 1960s thanks to mining in the region. When the last copper mine closed in 1965, the last steamboat route which called at Mertola also came to an end. 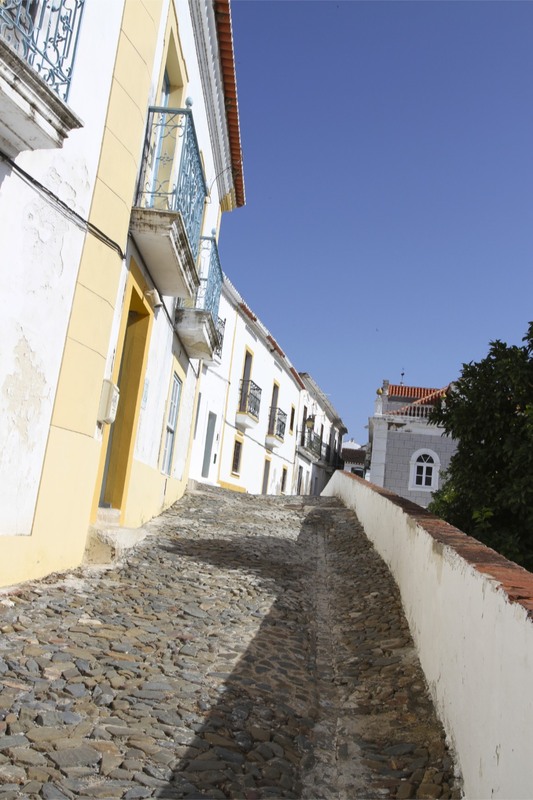 From the top of the castle you can almost sniff the ocean, and that was where we were headed…well once we’d had a walk through the town and a well deserved pastel de nata. I don’t recall the name of the cafe where we had breakfast, but the pastel de nata was the most delicious we had during the whole journey.